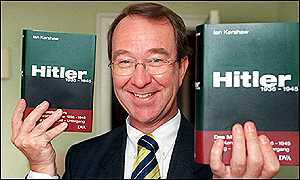 HAVE you read Ian Kershaw's 'biography' of Hitler? If you have, then you've got a lot more patience than me. Frankly, I gave up in despair halfway through the first volume of this 'award-winning' opus. The learned professor has excelled himself, since Hubris is even duller than his The Nazi Dictatorship, a feat which, before picking up Hubris, I would have thought wellnigh impossible ! Have you finished your biography of Himmler ? If so, then I look forward to reading it. I'll never forget my first reading of Hitler's War! It thrilled me to bits, and still does. At the time, the newspapers were calling you this and that, and ignorant people were taking it all in and repeating it without thought. I used to say to them: "Why don't you read what David Irving has written, rather than have it misrepresented to you by lawyers, Jews and petty-minded academics?"